I am happy to finally report that the last chick in the metro area has fledged successfully! I visited last Sunday and the juvenile was still in the nest, and on Tuesday she was gone, and could not be found anywhere, in spite of searching for two hours. I don't consider it a successful fledge until I see the youngster flying and returning to the nest, landing well. Today I visited again and the chick was on the nest eating, she flew off and I searched and found her perched in a tree! And I must say she is a beautiful female...large with dark, distinctive spots evenly scattered over her breast. I hope she will be around for several more weeks at least with one of her parents. A more disturbing discovery yesterday was that a cell company had removed a nest shortly after the chicks fledged, while they were still dependent upon that nest for feeding. I was so surprised that they did not wait another month, when the birds would have been gone. I suspect this was an illegal removal, without the required permits. I have notified the DNR. Many osprey families appear to be totally gone now, the nests so empty and quiet. But with so many late breeders, there are still Ospreys to be found, though it takes some searching, waiting, listening, to find them. It's a game I play this time of year, finding a few Ospreys makes for a successful day in the field! Now I finally have time to just sit and watch, without having to rush on to the next nest. I no longer try to cram 20 nests into a day. I use the time at an empty nest to work on updating the data charts as I wait for an osprey to show up, entering band numbers as I listen for the sound of food begging. When and if they do show up, I set the iPad aside and focus all my attention on the Ospreys. What can you teach me today? I treasure every moment I get to spend with them. Some interesting behavioral observations today. As the breeding season winds down, I still like to search for my osprey friends and see what's going on. There is always something to learn if you just keep watching and open your mind. I visited a bunch of empty nests, and at one nest, which held three chicks earlier, I found one male juvenile on the nest, snoozing and occasionally food begging. You all know the drill now....when Dad approaches with a fish, the chick gets almost apoplectic. So excited. Dad dropped the fish and escaped quickly and the young male took the bright goldfish and flew up into the air and flapped his wings at a very fast pace, hovering and dropping and flying upwards again....while trying to imitate the courtship vocalization! "Eeeedle-eet." (Forgive me...there are no adequate words to express that vocalization in a written post). At first I thought, isnt that cute...he is practicing a sky dance! I have not seen this before, or it didn't register in my head what was happening. When you think about it, this young bird was not even an egg when these behaviors were being exhibited by the adults. Chances are, it is not something he has observed and therefore is not imitating in the true sense of the word. This is a behavior that is deeply encoded in his DNA, or, as I have said before regarding flight or fishing, he is hard wired to do this. There was something about his excitement in having that bright gold fish that made him want to display it, to be seen by other Ospreys...preferably a female I suppose. It was just instinct, saying " look at me and my fish"! It didnt last long before he headed off to a tree to eat his lovely fish. But I recognized the behavior and the vocalization, tho it was brief. Delightful. Today I went to check on some of those chicks that had not been confirmed as fledging successfully. The first nest I visited hatched two chicks, and one of them had fledged quite a while ago...I had seen her flying and returning to the nest several times. But the second chick was always in the nest! There did not appear to be anything wrong, but I just never saw her fly, or found her perched elsewhere. I watched for almost an hour and all she did was preen and food beg. The rest of the family were coming and going. They all disappeared eventually leaving this chick home alone. I decided to go check a few other nests and come back. When I got back an hour later she had not moved...still standing in the nest preening. I finally said out loud, out of total frustration and worry..." Will you please fly so I know you are OK!" That's all it took! She immediately stretched her wings, flew off the nest, circled around the nest in a large loop and returned to the nest and landed perfectly! Ha ha! I am not kidding! What an obedient osprey! All is well...she is just a homebody. Then I headed off to the other nest I had been watching where the single chick has not fledged. This one was still in the nest alone. The adult female was perched nearby. I watched for over an hour here as well . The chick did some flapping and hopping and is getting a little loft....flew from one side of the nest to the other, but is still primarily standing there watching the world go by. I can tell that this one is not quite physiologically ready to fly. It will be soon, but she is still pretty calm, not flapping with the focus, energy and enthusiasm that a chick that is about to fly does. It can almost seem frantic sometimes as they flap, flap, flap. It's late. She will get there. I will try to get back there this weekend. This will be the final chick to go here, I think. And she still has a lot of learning ahead post fledge! I did not see the male here today, but the female stayed close by, watching over the youngster. Hope the adults will stay around for another month so this chick will be cared for as she develops all those skills she needs to migrate successfully. You know I will be watching! Ospreys look especially lovely with red and gold leaves behind them! Went out in search of a particular osprey today, actually several of them, but did not find the ones I was searching for. But I stopped at one nest and found all three chicks still present on and around the nest. All were quiet. Suddenly they burst into that desperate, raspy, whining sound of food begging....wings went out and down in a subordinate position as they hollered so loudly. I laughed out loud. Dad must be on his way! Sure enough, Dear old Dad arrived on the nest as two chicks dove for the fish, a serious tug of war broke out. Of course Dad departed as quickly as possible. Then one of the chicks on the nest flew up in the air and made a particular vocalization that adults commonly make when they see a Bald Eagle. It was kind of cute to hear a juvenile try to replicate that sound. I understood it! And then a large adult Eagle flew above the nest, followed by a juvenile eagle. All three chicks scattered in all directions. The juvenile eagle went after the one with the fish. Oh dear. I lost them behind some trees and I waited anxiously....and one by one they all returned to the nest, without a fish. Smart! The one with the fish must have dropped it, rather than fight with an eagle! Then they all started hollering again. This time, Mom arrived with a fish! Yeah! She is still around and still helping to feed this large brood! Many females are hard to find now so I was surprised to see her. The whole family was well and accounted for! That is not the case on many nests now. I moved on to another nest where I found two chicks on the nest, also hollering for food. Desperate, hungry, cries that escalated to a pitch which announced that Dad must be in sight. He arrived shortly with a fish, and again, these two struggled to gain control of that piece of gold! In fact, this struggle was so intense, they both fell off the nest, and a chase ensued. Eventually they found their way back to the nest and of course, neither had the fish. Oops. So the food begging began anew. Ya gotta laugh. So noisy. But the instinct to "bulk up" before migration is strong. Their survival may depend on it! I had to leave before another fish was delivered...but the male here is still working hard to care for these youngsters. The last nest I visited today revealed two adults calmly and quietly eating their own fish. No food begging heard, no chicks seen. So these adults are still sticking around, in case they are needed, and preparing for their long trip south. I enjoy every last moment spent with these birds, still trying to clarify some research details, be sure our data is accurate, and just soaking up the sights and sounds of these magnificent raptors. Friday morning, August 19, 8:20 a.m.....Fledged! Mom is on the nest looking for little Arb.....I didn't see the moment she took off...hoping she gets back to the nest soon! Little Arb made it back and landed on the perch at about 11 a.m! She stuck her landing like a pro and then had some lunch with Mom! We can celebrate! Little Arb chick is falling asleep standing up friday afternoon after her big day....seems like just yesterday I watched her wiggle her way out of that small egg....and now she is a real osprey that can fly! After years of failure at this nest, we are so happy to see this day come. We will continue to watch over her and her antics. She will continue to return to the nest to eat for many weeks, and if she does try her luck at fishing, she will still rely on Dad as her back up if she is hungry. The adult female may begin her migration within the next few weeks but this chick may stick around with Dad until some time in mid September before they head south. Those females are tied to the nest thru all the weeks of incubation and care / feeding of chicks, and now she will be a little more free, to fly, build up her strength and prepare for migration. I see signs already....she is eating a lot to prepare for the big trip ahead to South or Central America. Some females leave quite early, in fact I believe some are gone already. But some females stick around a bit longer. Chicks can get into a million different kinds of trouble post fledge and fewer than half will survive the first year, so let's keep our fingers crossed for this one to stay safe, and stay close to home. Let's talk about feathers! What do the feathers go thru to be prepared for flight? As the new feathers grow in on our young Ospreys, the shaft is full of blood. Therefore they are called " blood feathers!" ( this is true of adults also as they molt and grow new feathers). These growing feathers are very fragile and if broken they can hemorrhage quite profusely. It can require medical care. That is why these nestlings need to be handled so carefully at banding time, approximately five weeks of age. As these youngsters approach fledging age the blood in the feather shaft begins to recede and the shaft begins to harden. On the reintroduction program, one of the indications that a bird was ready to fly was that the feather looked different. We would examine the flight feathers closely to see if the shaft of the feather was beginning to look clear or white rather than engorged with blood. These feathers are referred to as " hard penned". These stiffened feathers are more able to sustain flight and can withstand the vigorous flapping that is typically observed prior to fledge. 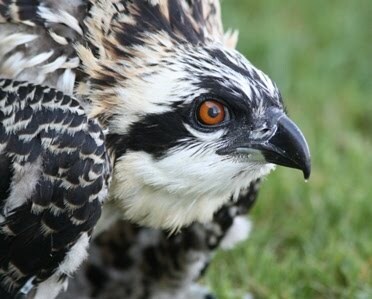 There is nothing an osprey can do to prepare the feathers or to promote this physiological stage of development. If we were to look at little Arbs feathers today, they might look a little striped, as the blood in the shaft has dried up and receded. That, along with the muscular strength she is developing, is what is required for her first flight. We are watching for indications that she can get some loft and hover a bit above the nest and come down in a controlled way. I expect her to make her maiden voyage soon! I have some updates to share as this breeding season begins to wind down. We still have some very late nesters with unfledged chicks! But many of our chicks have fledged, including the two nests, six chicks, that share the same father. The bad news on this situation is that one of the nests, which was on a transmission tower, has collapsed. This male was so busy providing food for these two families that we rarely saw him bringing sticks or working on the nest as most males do during the breeding season. The female did bring a few sticks, but between the lack of maintenance and the heavy rains we have had this summer, most of the nest fell last weekend. There are a few sticks still up there and the chicks still return there to grab a fish from mom or dad. We are so happy that all chicks had fledged when this happened and it is still their home base. It will be interesting to see what this male does now. Will he rebuild this nest, originally built by another male, or will this bring a natural end to his polygyny? Sadly I must also report that the nest that had four chicks only seems to have fledged two. I have been back several times to look for chicks and have only found two, which have fledged successfully. I am not sure what happened here. With so many nests to watch, I can't get back as often as I would like. Believe it or not we are still finding new nests! We deeply appreciate the people who report new nests to us, since trying to keep track of all nests in eight counties is a big job! I do find some of them, as do my volunteers, but some we might never find if it weren't for the public keeping us posted about what they observe in their neighborhoods! New nests are often built late in the season in preparation for next year. We try to read all bands on the birds building these late nests to be sure they are not frustration nests. We are working hard to confirm successful fledging and make sure our final chick numbers are accurate. I spent a full day in the field with one of my great volunteers yesterday. We checked about 18 nests and I visited a few more on the way home. At this time of the breeding season we are trying to accurately account for successful fledging of the chicks. We try to find each chick that we have been observing since hatching. Sometimes this requires searching all the surrounding trees, moving around for different views, listening carefully for food begging. A successful nest is one where at least one chick was known to have fledged successfully. That does not mean it flew away. It means it flew and landed successfully and has returned to the nest to eat. We referred to past visits and the number of chicks noted in each visit. We try to document mortality rates, so that means narrowing down what period of time a chick may have disappeared, going over field notes to arrive at the answer. Then we begin to search for all the chicks seen on previous visits. I get a great feeling of satisfaction when we can account for all chicks. We also realize that less than half of these chicks will survive their first year. These youngsters can get into a million kinds of trouble post fledge. We will continue to observe as long as we can tho some volunteers may begin to pack up their field notes after fledge. Some of us keep watching until we can no longer find any Ospreys. This year we had quite a few late nesters so we will be watching a few nests for quite some time, well into September. On one of the nests I visited on my way home, I had not found any Ospreys on the nest this week. I was worried. The male finally arrived with a fish, but did not go to the nest. He perched on a light pole and began eating a fish. Where did the chicks go? What happened? Ahhhhh, there it is, that tell tale raspy, whining sound of a juvenile food begging. I could not find the chick tho! It took me quite a while, moving around until I finally spotted the young one in a tree, whining desperately! All is well, this nest is successful, the young one can fly, land in a tree and is still here asking for food. In the process of visiting all these nests yesterday, we also saw a family of sand hill cranes in a field, a doe and her two fawns that were still trying to nurse while their tails were wagging at lightening speed. She was trying to drag them away from the road while they nursed! Funny. We also observed a young bald eagle feeding on a dead raccoon while an adult watched over him, they both flew, were joined by another adult, soaring together, and the juvenile landed in a very tall cornfield. Interesting choice! I love spending time in the field with the volunteer monitors, as we learn together, putting the pieces of the puzzle together on each nest.